Via Imagery is a wedding photo & video company based out of Santa Barbara, CA. 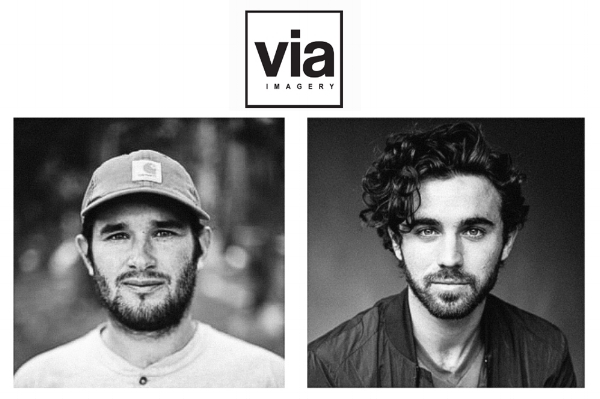 Tynan Daniels and Tony Modugno are photographers and videographers born and raised in Santa Barbara, CA, and currently working in Southern California. Friends for more than 17 years, these two have teamed up to combine their creative talent and their ability to tell a story. This duo works effortlessly together as they seem to have the ability to predict and capture the next perfect moment. Their goal is to get to know you and work with you to make a vision of yours come to life. Michelle's photography style is intimate and classic. She photographs with a journalistic approach and strives to capture timeless and emotional imagery. Her easy going personality is an important element in helping couples feel comfortable in front of the camera. Michelle graduated in 2003 from the Brooks Institute of Photography in Santa Barbara and immediately jumped into photographing weddings and families in the area. Although she is now based on the central coast she mostly caters to clients in the Santa Barbara and Santa Ynez areas and has traveled as far as Costa Rica, Canada and Mexico for destination weddings. Hi, I’m David Pascolla, a fine art wedding and portrait photographer in San Luis Obispo. I specialize in Ranch, Vineyard and Private Estate weddings in Santa Barbara, San Luis Obispo, Paso Robles, Napa and beyond. I'm a lover of soft, natural light that accentuates beauty and emotion. My clients tend to gravitate towards a natural yet stylized approach to their day. My work has been published in California Wedding Day along with numerous weddings featured on Style Me Pretty , Wedding Chicks, Ruffled and Style Unveiled wedding blogs. I am the recipient of 2012 through 2014 Wedding Wire Bride’s Choice Awards which recognizes the top local wedding professionals from Santa Barbara to San Luis Obispo. I Consider myself a passionate, experienced, professional photographer; with over 30 years of life through the lens. My first paycheck, ever, for photography, was from Surfer Magazine. Will photograph your wedding or event with a unique point of view, with strong use of your environment, and the people in it. Love to just capture moments, but I can give direction, when needed. Born and raised in Santa Barbara, now located in Ventura. I Love to travel. Hi! I'm Karen, owner of Karen D Photography. My aim is to capture the present for your future, in a vivid, artistic and realistic manner. I prefer to capture candid, loving moments as they occur, but will also guide you and your sweetheart to create magical and romantic photographs. I want to get to know you two--as individuals, as a couple and as a family. Being in front of a camera can be intimidating, but once you feel comfortable with who's behind it, you'll feel comfortable being yourselves. If you're looking for vivid, romantic and natural photos, you've come to the right place. If you're also searching for a photographer who is personable and cares about you having the best day and experience possible, even better. If you have any questions or want to chat about your big day, I'd love to hear from you!